NanoSentuating Systems Laboratory aims to develop the integrated multi-functional NanoSentuating N/MEMS Systems (Figure), where nano-scale sensing and actuating functions are integrated with cognitive functions in a single chip; thus achieving the autonomous nanosentuating functions required for high-performance Nano/Micro Elelctro Mechanical Systems(N/MEMS). Laboratory’s key strategy and unique research directions are focused on the invention of a new class of sentuating nanodevices (NT) inspired from biological sentuating organs (BT) for their applications to next-generation information (IT) and medical (MT) systems. Recent topics on the bio-inspired sentuating devices for specific applications include: muscle-inspired interferometric color modulators for optical display; cognitive tactile transceivers for bi-directional rational and emotional interface; muscle-inspired nanoactuators for biomolecule detection; elbow-inspired rotating mirrors for optical display and communication; worm-inspired DNA separators for DNA sorting and extraction; circulation-inspired biomolecule counters for cell concentration detection; spleen-inspired lysis devices for cell aging and deformability monitoring; mitochondria-inspired fuel cells for potable power generation; eel-inspired electrolyte batteries for high-voltage electrical power generation; heart-inspired fluidic injectors for digital inkjet printing; etc. Integrated NanoSentuating Systems for Nano-scale Multi-modal Information Carriers. Developed are the miniaturized electromechanical digital actuators, such as silicon muscle chips, mechanical digital-to-analog converters, modulators, and manipulators, as well as the inertial microsensors, including accelerometers, gyroscopes and magnetic detectors, combined with electronic circuits and communication modules for applications to automotive electronics, aerospace navigation, computer devices and electronic games. Optomechanical mirrors, waveguides, and optical components are combined with light sources, detectors, optical fibers, waveguides, and connectors for applications to high-density information storage and high-speed optical communication systems. Digital injectors, propulsion devices, fluidic digital-to-analog converters, microfluidic separators, pumps, valves and diffusers are combined with heaters, channels, mixers, and reactors for applications to digital ink-jet printers, pressure regulators, flow controllers, fluidic distributors, biomolecule separators, lab-on-a-chip, and micro total analysis systems. Fundamental research topics include analysis and design, materials and processes, characterization and evaluation for the phenomena and principle involved in the understanding and invention of multi-modal, multi-scale devices and systems. A human stress monitoring patch integrates three sensors of skin temperature, skin conductance, and pulsewave in the size of stamp (25 mm × 15 mm × 72 μm) in order to enhance wearing comfort with small skin contact area and high flexibility. The skin contact area is minimized through the invention of an integrated multi-layer structure and the associated microfabrication process; thus being reduced to 1/125 of that of the conventional single-layer multiple sensors. The patch flexibility is increased mainly by the development of flexible pulsewave sensor, made of a flexible piezoelectric membrane supported by a perforated polyimide membrane. In the human physiological range, the fabricated stress patch measures skin temperature with the sensitivity of 0.31 Ω/°C, skin conductance with the sensitivity of 0.28μV/0.02 μS, and pulse wave with the response time of 70msec. 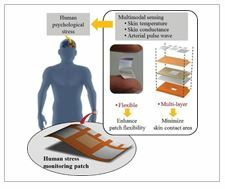 The skin-attachable stress patch, capable to detect multimodal bio-signals, shows potential for application to wearable human emotion monitoring system. The cognitive piloerection sensors are developed to monitor Human emotional status by measuring the goosebumps appeared on Human skins. It is demonstrated experimentally that the interlocking spiral electrodes of the piloerection sensors are effective to measure the goosebumps at the sensitivity of 00252%/μm in the range of 0~318μm. High wearability of the flexible sensors shows strong potentials for interactive Human emotional communication devices and human-machine cognitive interface systems. A portable sweat rate sensor is developed by integrating a thermo- pneumatic actuator for daily time human thermal status monitoring. The portable sweat rate sensor, having a size of 38 ± 0.5 mm × 41 ± 0.5 mm × 29 ± 0.5 mm with a total weight of 63 ± 1 g, is capable of lifting the humidity chamber 1.91 ± 0.27 mm above the skin in a movement period of 3 min. The present sensor measures the sweat rate with a sensitivity of 0.056 (pF/sec)/ (g/m2h) and a linearity of 99.1 % in a sweat rate range of 3.76~137.68 g/m2h. The integrated actuator reduces noise by blocking the external environmental wind. Therefore, the developed portable sweat rate sensor has high potential for human daily time thermal status monitoring applications. The nano-bio-medical convergence research is focused on the cancer diagnosis and prognosis prediction based on the characteristics of circulating tumor cells (CTCs) in patient’s blood. The research scope and technology development are focused on viable CTC isolation and pre/post-processing, bio-inspired CTC culture and drug response analysis, multi-modal CTC characterization, animal CTC models and metastasis function analysis, and real-time visualization and rare cell analysis. The CTC isolation device are invented with microfabricated tapered-slit filters for high-throughput viable CTC isolation. 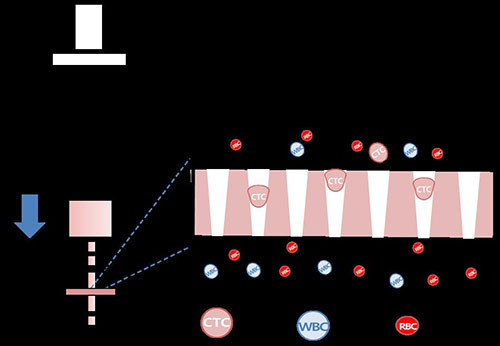 The optimal CTC isolation conditions are achieved at the blood flow rate of 20 ml/hr, where the capture efficiency of 80%, the recovery rate of 84%, and the viability of 82% are demonstrated experimentally. The CTC separators also reduce the captured cell stress to 18% of the conventional CTC isolation devices. 2. Jiyoon Bu, Young-Ho Cho*, and Sae-Won Han, "Enhancement of Isolation Sensitivity for the Viable Heterogeneous Circulating Tumor Cells Swelled by Hypo-Osmotic Pressure," Royal Society of Chemistry Advances, Vol.7, Issue 78, pp.49684-49693 (2017). 3. Yoon-Tae Kang1, Min-Ji Kim1, and Young-Ho Cho*, "Cell Impedance Measurement Device for Cytotoxicity Assay Dependent on the Velocity of Supplied Toxic Fluid," Submitted to Journal of Micromechanics and Microengineering, accepted (2018). Jiyoon Bu, Young-Ho Cho*, and Sae-Won Han, "Enhancement of Isolation Sensitivity for the Viable Heterogeneous Circulating Tumor Cells Swelled by Hypo-Osmotic Pressure," Royal Society of Chemistry Advances, Vol.7, Issue 78 (Oct. 25, 2017) pp.49684-49693. Yoon-Tae Kang1, Young Jun Kim1, Jiyoon Bu, Young-Ho Cho*, Sae-Won Han, and Byung-In Moon, "High-purity Capture and Release of Circulating Exosomes using an Exosome-specific Dual-patterned Immunofiltration (ExoDIF) Device," Nanoscale, Vol.9, Issue 36 (Sep. 28, 2017) pp.13495-13505. 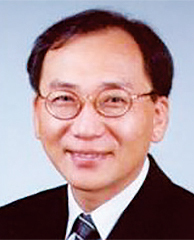 Dong Hoon Suh, Miseon Kim, Jin Young Choi, Jiyoon Bu, Yoon-Tae Kang, Byung Su Kwon, Banghyun Lee, Kidong Kim, Jae Hong No, Yong-Beom Kim*, and Young-Ho Cho, "Circulating Tumor Cells in the Differential Diagnosis of Adnexal Masses," Oncotarget, Vol.8, No. 44 (Aug. 24, 2017) pp.77195-77206. Yoon-Tae Kang, Il Doh, Jiyoung Byun, Hee-Jin Chang* and Young-Ho Cho*, "Label-free Rapid Viable Enrichment of Circulating Tumor Cell by Photosensitive Polymer-based Microfilter Device," Theranostics, Vol.7, Issue 13 (July 22, 2017) pp.3179-3191. 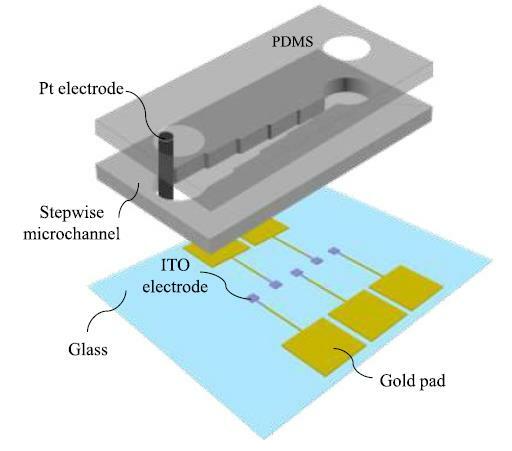 Tae Hee Lee1, Jiyoon Bu1, Jung Eun Moon1, Young Jun Kim, Yoon-Tae Kang, Young-Ho Cho*, and In Sik Kim*, "A Multi-Staining Chip Using Hydrophobic Valves for Exfoliative Cytology in Cancer," Journal of Micromechanics and Microengineering, Vol.27, No.7, Paper No.075022 (July 2017) pp.1-9. Jiyoon Bu1, Tae Hee Lee1, In Sik Kim*, and Young-Ho Cho*, “Microfluidic-Based Mechanical Phenotyping of Cells for the Validation of Epithelial-To-Mesenchymal-Like Transition Caused by Insufficient Heat Treatment," Sensors and Actuators : B, Vol.B244 (June 2017) pp.591-598. Jiyoon Bu1, Young Jun Kim1, Yoon-Tae Kang, Tae Hee Lee, Jeongsuk Kim, and Young-Ho Cho*, Sae-Won Han, “Polyester Fabric Sheet Layers Functionalized with Graphene Oxide for Sensitive Isolation of Circulating Tumor Cells," Biomaterials, Vol.125 (May 2017) pp.1-11. Jiyoon Bu, Yoon-Tae Kang, Yong-Seok Lee, Jeongsuk Kim, Young-Ho Cho*, and Byung-In Moon, “Lab on a Fabric: Mass Producible and Low-cost Fabric Filters for the High-throughput Viable Isolation of Circulating Tumor Cells," Biosensors and Bioelectronics, Vol.91 (May 15, 2017) pp.747-755. YoonHee Chang, Jiyoon Bu, and Young-Ho Cho*, "Frequency-Dependent Impedance Analysis for Discriminating Cancer and Normal Cells Using Microchamber Array," Sensors and Materials, Vol.29, No.3 (March 15, 2017) pp.293-301. Yoonji Kim, Jiyoon Bu, Young-Ho Cho*, Il Tae Son, and Sung-Bum Kang*,, "A Viable Circulating Tumor Cell Isolation Device with High Retrieval Efficiency Using a Reversibly Deformable Membrane Barrier," Journal of Micromechanics and Microengineering, Vol.27, No.2, Paper No.025015 (Feb. 2017) pp.1-10.